Ah, my mistake. I read @chrishent‘s “The gate in the run was open” as referring to the one at the Greenfield end. The gate at the Oakland end was there, but open, when I passed this afternoon. Maybe someone should lock it up with their own lock. Fight fire with fire? F them! It will get cut off by a resident or the city considering the city needs access to that gate… so don’t do that. I agree don’t do that. A guy in a black sedan chose it idle right in front of the north gate today at about 5 as I was coming to the trail head but it wasn’t hard to get by him. Just strange and a bit annoying. Heading north through the hollow tonight around 5:30, I did see a police SUV heading the other way. But it had lights on (no siren), was driving in the gravel, and was going at a fairly reasonable speed – I would say around 10-15 mph. Maybe the word has gotten around to Zone 4. 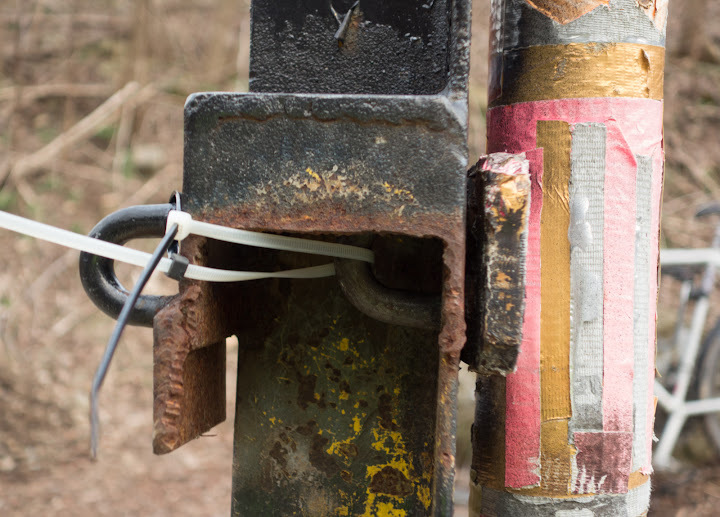 A couple days ago I saw a wire tie “lock” on the Boundary St / Junction Hollow Trail gate. Cute! That must have been cut. It was open this morning. Well, I guess that is that. Just be careful as police will no doubt be barreling through there often. Probably best to ride on the side area and let them have the paved roadway. I suspect the potholes and such will start forming with all the heavy vehicles using the road. Trucks damaged a side road by my house while they did bridge/turnpike work. After all the work was done, they repaved the the roads that were damaged by the construction vehicles. Maybe we’ll get lucky when the various projects in the area are complete. @gg says “well I guess that is that”. I’m not so sure. If the police are abusing bike trails on a routine basis, do the citizens have to tolerate that? > If the police are abusing bike trails on a routine basis, do the citizens have to tolerate that? As a reminder, Oakland’s Green Team bike/ped/etc committee meets this week, Thursday at 6pm at the Oakland Career Center, Semple at Louisa. I hope to be there (and will try to remember to bring this up); I hope to see others concerned about this issue there as well. Next meeting of SH Bike/Ped group is Thu, April 14, 6:30pm – 8:30pm. Well, especially after the bridge closure, Swinburne might have a lot of traffic on it, which might delay an officer, whereas the bike path would be free and clear of any obstructions! Nobody uses bike paths anyways; at least nobody who matters. As for damage to the path… Well, that’s reparable. And while it’s being fixed, it could easily be widened to accommodate two lanes of motor vehicle traffic, and this whole annoying “biking” thing could be resolved once and for all. That’s just smart urban planning, no? I think the primary issue with police usage of the trail is that some officers are careful, and some are not. Some drive slowly and carefully pass trail users, and some don’t. If they’re responding to a call and the lights and sirens are on, then by all means drive quickly and people should clear the way…but I’ve never actually seen lights and sirens on the trail. I’ve seen cops using the trail and at a good clip around a bend there (almost met his bumper!) on an occasion at least a YEAR or more before the bridge closed. Use 911 for this sort of thing (violations of the law). 311 is for infrastructure problems like potholes and broken street lights. Though with 911 you will have to give a street intersection, and the trail isn’t on their map. I guess you’ll have to say 100 or 626 Boundary St, whichever is closer. I just asked to have this issue added to the Green Team meeting tomorrow evening, citing this thread. Please join us this Thursday, March 17 at 6:00pm in the Oakland Career Center, 294 Semple Street. We will talk about specific designs/ideas for how to make Neville Street safer for cyclists and pedestrians, increased traffic enforcement in Oakland, provide updates on the City’s process for selecting a Bus Rapid Transit alignment, and discuss the proposed final section of the Bigelow Blvd bike lane. I just wanted to share a little positive cop-on-trail encounter I had this morning. There was a motorcycle cop on the Eliza Furnace trail this morning. He was cruising at a very appropriate speed (probably within the 15mph limit) with his hazard lights on, and was giving plenty of room to trail users. Even gave me a friendly nod. I’ve seen the police and Public Works vehicles go through the Hollow…giving them the benefit of the doubt..snow removal…on patrol…Today I witnessed a PW vehicle attempt to use the trail from the Boundary Street side. 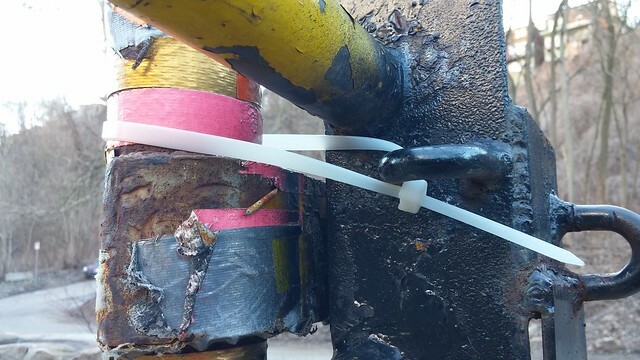 Someone had “locked” the gate with a plastic tie. When the passenger went to open the gate and saw it fastened, he returned to the vehicle saying it was fastened…and they turned around and left. I may be mistaken, but if they were approved to use the road, they could hsve easily broken the tie. I spoke to some people at the gate, and the confirmed that a cyclist had tied it…anyone care to come clean????? Some pics including the license of the vehicle. b) Vehicles confined to roads. 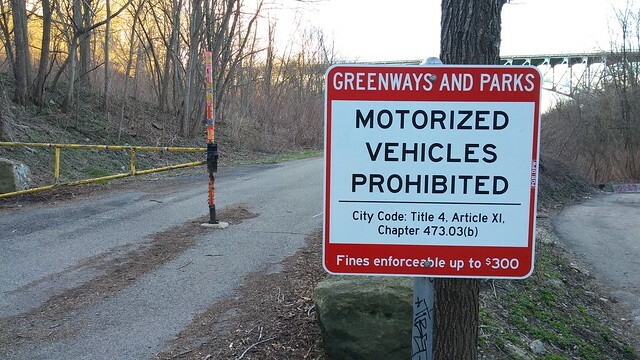 No person in a park or in a greenway shall drive any vehicle on any area except the paved park roads or paved greenway roads or parking areas, or such other areas as may on occasion be specifically designated as temporary parking areas by the Director. For purposes of this section, the definition of vehicle shall include but not be limited to an automobile, truck, all-terrain vehicle (“ATV”), quad, motorcycle, motorbike, or motorized dirt bike. e) Bicycles confined to roads. No person in a park shall ride a bicycle on other than a paved vehicular road, or path designated for that purpose. A bicyclist is permitted to wheel or push a bicycle by hand over any grassy area or wooded trail or on any paved area reserved for pedestrian use. As far as PDW is concerned, are there any trashcans between the two entrance points? Otherwise, they’re just taking a shortcut, and for what? Whats to prevent them from driving on all the trails when it’s convenient? Someone cut that tie. It was open today. It wasn’t me, as much as I want to do it. Whoever is doing it should keep doing it. Went by there today by chance… The whole gate still seems to be intact and there’s no reason it couldn’t be locked. I think there are trash cans on the trail. I recall a DPW truck emptying a trash can into the pickup truck a year or two ago (I presume the trash cans are still there). Aside from the trash cans(which, yes, are there as previously stated), debris on the trail doesn’t magically disappear on its own. From memory and checking yesterday, the only trashcans are on the run side, by the parking lot. There aren’t any trash cans actually along the field, like by the soccer field or anything, unless I overlooked them Sunday. Not to mention, there isn’t anything preventing DPW from coming in on The Run side, getting all the garbage (really doubt they’re picking up trash around the park on foot) and then going back out on The Run. I.E. They don’t NEED to go through both ends to do their duties. Google street view shows a can about mid way down the trail but the image is from 2008. Even if there were no cans there, again, debris doesn’t clear itself from the trail and crews do sometimes litter pick loose garbage as well as cut the grass on the soccer fields and the brush along the trail that would be all over the trail of they didn’t. I just find it a bit odd that people would take issue with crews using vehicles on trails(which have signs authorizing those vehicles) in order to maintain those trails so that you can use them especially if they are driving in a safe and cautious fashion; if they are not, that should be reported. Obviously, I can’t say that a crew is always on the trail specifically to perform work in that exact area, but people shouldn’t jump to conclusions, either, since there is plenty of work to be done that they may not realize (as demonstrated by the assumption that crews couldn’t possibly be collecting litter since there were no bags in the truck even though most city litter cans don’t have bags in them). In addition, there is a small park on the Oakland side of the JHT which is their responsibility, as well. 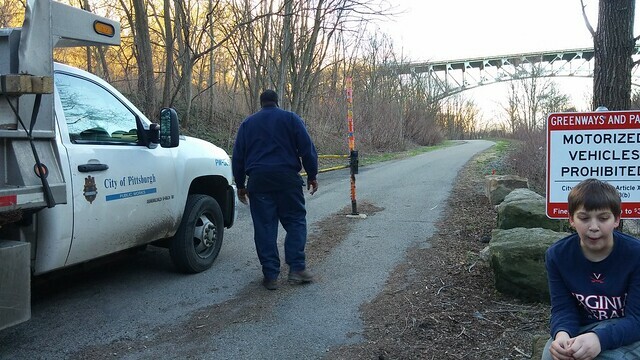 Crews can do whatever they want without the trail being open for through-traffic. One end can be closed with the infrastructure already in place. It’s not so much a problem of DPW and police going through, it’s people going through who have no legitimate use for doing so. There were also vehicle tracks when snow was on the ground. Again, dubious DPW is trimming brush in January. I’m not sure if you read every post in this thread but DPW has placed countless locks only to have them repeatedly cut off. Clearly it is ineffective and also a waste of money to some extent. In addition, gates have been ripped out and boulders moved also resulting in loss of money with no real benefit. As a result, it seems the only solution to this problem is enforcement and catching the offenders. 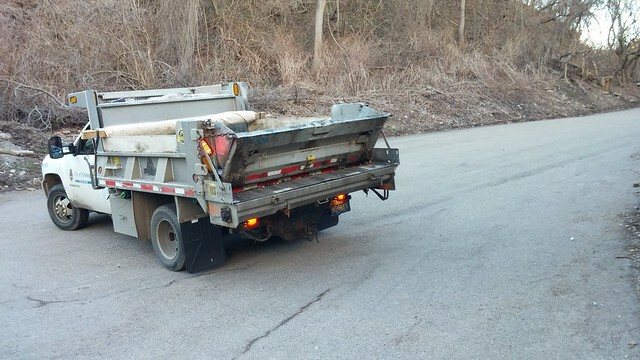 Also, DPW does have some vehicles equipped specifically for garbage such as rat packers that look like little garbage trucks and specially equipped pickup but a lot of collection is done with dump trucks. Again, I work for DPW and used to commute via this trail. The park foreman shares the same frustration with personal vehicles using the trail and I contacted both the police/park rangers to try to get some more attention to this after I saw the video posted by mattjackets both of them said they would try to increase their presence around rush hour to catch the offenders though the Park Rangers seemed to have more of the availability to do so. If the lock keeps getting cut, then stop relying on a locking gate. Why not just get a substantial bollard? AFAIK, the point of having a passable gate at both ends is for emergency vehicle access. In a small park like this one, I’m not sure if that’s really necessary. The usual tradeoff…security versus convenience. Personally, I’d be fine with a real barricade on one end or the other. It’d be easier to do it at the Oakland end, but, from an emergency services perspective, I’m not sure which end should be left open to minimize response time. When the parking lot gate existed and was consistently locked, some people began moving the large boulders at the perimeter of the parking lot to get through. Many more boulders were put in place, and the gates were reinforced and relocked, and months of peace were found on the trail. The emergency vehicle use is understandable, however does each police car and ambulance really have a key for every restricted entry point in the city? I doubt it…and even if they did, searching through that keyring would take much longer than running to respond to the emergency. So, with padlocks on the gates, they’re pretty much permanent barriers anyway. Why not cement in some bollards on one side, and have a lockable fixture on the other. I suggest the permanent fixture be on the oakland side, since it’s been demonstrated that a few tons of rock are willing to be moved to circumvent the fixture on the parking lot side. Additionally, if the locks are being cut. Buy a better lock. Look into boron shackles. There are many locks that can’t be easily cut without a torch or power tools. The last lock I saw on the gate was a Master lock, which is the bottom of the barrel when it comes to locks. Perhaps collapsible bollards would be useful here (the ones which fold down (search “collapsible bollard”), not the ones where the bollard is removable). Emergency services and DPW can collapse the bollard when necessary; the very fact that other drivers see a bollard, and have to stop and leave their car to continue on, hopefully can deter most unauthorized vehicles from cutting through. And of course, the bollard can be uncollapsed by any non-motoring people when passing by.